I wasn't expecting a lot, because I'd read some rather harsh reviews, but most of what they said turned out to be untrue. Well at least if you don't remember a single thing from the graphic novels, like me. Visually this movie is stunning. Like Star Wars and The 5th Element and Avatar on speed and LSD. The pace is generally very good with the exception of a period near the finale, where it slows down too much and things get spelled out for the ridiculously slow. It should have lost maybe 20 minutes of it's length to tighten it up a bit. 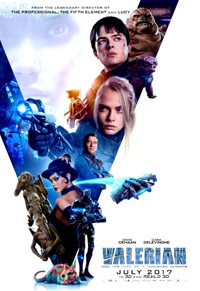 Dane DeHaan is not the best choice as Major Valerian. He's a bit dull and his acting didn't impress me. That said, I kinda liked the dark humor between him and Cara Delevingne as Sergeant Laureline, and I liked her performance much better. People who say the movie is without humor, must be from a rather boring planet. Even Rihanna doesn't ruin the movie. I'm no fan of hers, but she did a great job here as the Alien character Bubble. The story is what it is. Evil humans, universal love, intergalactic special agents. It doesn't matter much. It's easy to follow and the visuals and all the great ideas just send you spinning. I'd love to re-watch it again later, and I don't think it will matter much, if it's in 2D next time, even though the 3D surely looked great.